Home / How to configure IMAP support in WSDesk? This article intends to explain how to turn your WooCommerce store into catalog mode with our WSDesk – WordPress Helpdesk Plugin plugin. Refer the product page to know more about other various features of the plugin. One of the many things WSDesk has an advantage over other WordPress support system is the ability to convert your emails into support tickets using IMAP protocol. WSDesk provides effortless steps to convert your emails into WSDesk support tickets with the help of IMAP integration. Pre-requisite: If you are using a third-party hosting service provider, you need to contact their support team to enable IMAP service. If you are using Gmail mailing service, you should configure a couple of settings in Gmail to get started with IMAP service. 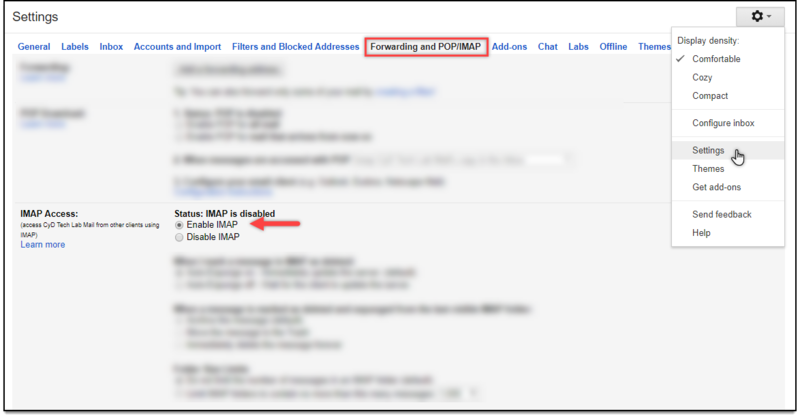 In this article, we’ll discuss how to enable IMAP service in Gmail, and configure relevant IMAP settings in WSDesk. 1) Open Gmail. Click on the gear icon on the top right corner, and click the Settings option. Next, under Forwarding POP/IMAP section, select Enable IMAP option, and save the settings. 2) The next step is to configure Gmail, to easily connect with WSDesk. Which means Gmail should be set up to allow access to WSDesk. For this, click on your profile icon in the top right corner of Gmail, and click on My Account button. Under the Sign-in & security setting, click App with account access option. In this section, turn on access to less secure apps, as shown in the screenshot below. Now it’s time to move to WSDesk. 3) To get started with IMAP service in WSDesk, go to WSDesk > Email > IMAP Email Setup. The IMAP settings are as shown in below screenshot. IMAP Server SSL URL – Provide your IMAP URL. For Gmail mailing service, your IMAP URL might look like as shown in the above screenshot (imap.gmail.com). Else, you can provide IMAP URL of your respective hosting service provider. IMAP Server SSL Port – Provide the port number of your hosting service provider (993 for Gmail). Email-ID – Enter email address from where emails are to be imported. Password – Enter the password for your email address. Finally, click Activate IMAP to activate IMAP service. Once IMAP is activated, all your new emails will be converted to WSDesk support tickets. You can move to the Tickets section to view all the tickets. Remember, only new emails after the IMAP activation are imported as tickets. The old tickets cannot be imported. The IMAP is only concerned with receiving emails. For enable sending emails, you need to configure SMTP. Refer this article to know ways to setup SMTP in WordPress.